I am excited to announce the publication of my new book: A Picnic Snack. The book is currently available through LuLu.com for $14.95 plus shipping. If you order by November 11th, you can use a coupon code to get FREE SHIPPING. The code is: HSQ2. If you will be anywhere near the Charleston, IL area tomorrow (Sunday, November 9th), please stop by the Charleston Carnegie Public Library between 1:00 and 3:00 p.m. for their first "Friends of the Library Author Fair." My family and I will be there with a table, presenting my two books: What is Communion? and A Picnic Snack. This event is open to the public and is free of charge. Over a dozen Central IL authors are planning to be on hand with their books available for purchase and signing. 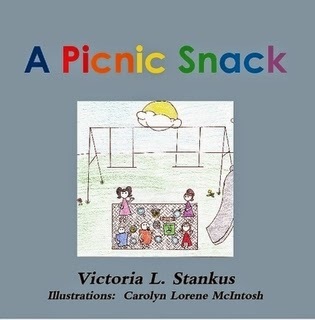 (Note: I will not have any of "A Picnic Snack" on hand for purchase tomorrow, but will have a sample copy available to browse through and you will be able to place an order.) This could be a great opportunity to get some of your Christmas shopping started! We would love to see you there!